72 กม./ชม. 66.8 กม./ชม. 68 กม./ชม. ปืนใหญ่ลำกล้องเกลียว เอ็ม68 ขนาด 105 มม. ปืนใหญ่ลำกล้องเกลี้ยง เอ็ม 256 ขนาด 120 มม. ↑ "According to the Army’s Office of Deputy Chief of Staff for Operations and Plans, 23 Abrams tanks were destroyed or damaged in the Persian Gulf area. Of the nine Abrams destroyed, seven were due to friendly fire, and two were intentionally destroyed to prevent capture after they became disabled. Other Abrams tanks were damaged by enemy fire, land mines, on-board fires, or to prevent capture after they became disabled." From Early performance assessment of Bradleys and Abrams, p. 24. ↑ "A Company, 3-66 Armor, Abrams (Bumper # A-33)". TAB H -- Friendly-fire Incidents. At approximately 4:30 AM on 27 February, an anti-tank guided missile (probably fired from a Bradley) struck A-33 in the engine compartment. The crew, uninjured, was evacuating the disabled tank when two DU rounds hit the tank in the left side of the hull and exited through the right side. The tank commander, driver, and gunner sustained injuries from fragments. The loader, who was already outside the tank, was uninjured. A-31 crew members assisted in rescuing A-33's crew. ; Sketch depicting the path of a DU 120 mm round through the hull of Abrams C-12. OSD. ↑ Komarow, Steven. "Tanks take a beating in Iraq", USA Today, March 29, 2005. ↑ Conroy, Jason & Martz, Ron. Heavy Metal: A Tank Company's Battle To Baghdad. Potomac Books, 2005, p. 158. ↑ Zucchino, David: Thunder Run: The Armored Strike to Capture Baghdad. Grove Press, 2004, pp. 20-30, 73. 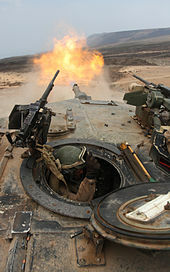 ↑ "Youtube: M1A2 Abrams struck by Vehicle-Borne IED". สืบค้นเมื่อ 2009-10-18. ↑ "Technical Intelligence Bulletins May - June 2003". Wlhoward.com. สืบค้นเมื่อ 2009-06-09. ↑ "Defense Update.com". Defense Update.com. 2006-04-25. สืบค้นเมื่อ 2009-06-09. ↑ "BBC: US to use depleted uranium". BBC News. 2003-03-18. สืบค้นเมื่อ 2009-06-09. ↑ Clancy, Tom: Armored Cav: A Guided Tour of an Armored Cavalry Regiment. Berkeley Books, 1994, pages unknown (will be updated). ↑ 27.0 27.1 "General Dynamics Awarded $34 Million for M1A1 Abrams Tank Upgrades" (Press release). General Dynamics. September 5, 2008. 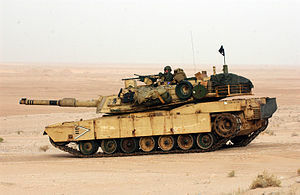 ↑ M1A1/M1A2 Main Battle Tank, USA, Army-technology.com. ↑ "Heavy duty: overhaul under way for Abrams tank engine". Accessmylibrary.com. 2006-09-01. สืบค้นเมื่อ 2009-06-09. ↑ Komarow, Steven (2006-03-09). "USA Today article". USA Today article. สืบค้นเมื่อ 2009-06-09. ↑ "M1070 Heavy Equipment Transporter (HET) Fact File United States Army". Army.mil. สืบค้นเมื่อ 2010-06-30. ↑ Anderson, Jon R. (10 April 2003). "1st ID task force's tanks deployed to northern Iraq". Stars and Stripes. สืบค้นเมื่อ 8 June 2011. ↑ "M1 Abrams Main Battle Tank". Fas.org. สืบค้นเมื่อ 2010-06-30. 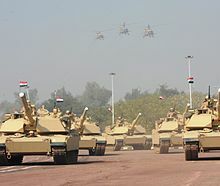 ↑ 36.0 36.1 "Armor: Iraq Getting M-1A1 Tanks". Strategypage.com. 3 August 2008. สืบค้นเมื่อ 2009-06-09. ↑ "Army looking into lighter Abrams tank". Army Times. 28 September 2009. สืบค้นเมื่อ 21 December 2010. ↑ "CATTB data". สืบค้นเมื่อ 2011-06-28. ↑ John Pike. "Grizzly [Breacher]". Globalsecurity.org. สืบค้นเมื่อ 2010-06-30. ↑ John Pike. "Panther". Globalsecurity.org. สืบค้นเมื่อ 2010-06-30. ↑ John Pike. 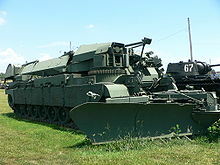 "Wolverine (Heavy Assault Bridge)". Globalsecurity.org. สืบค้นเมื่อ 2010-06-30. 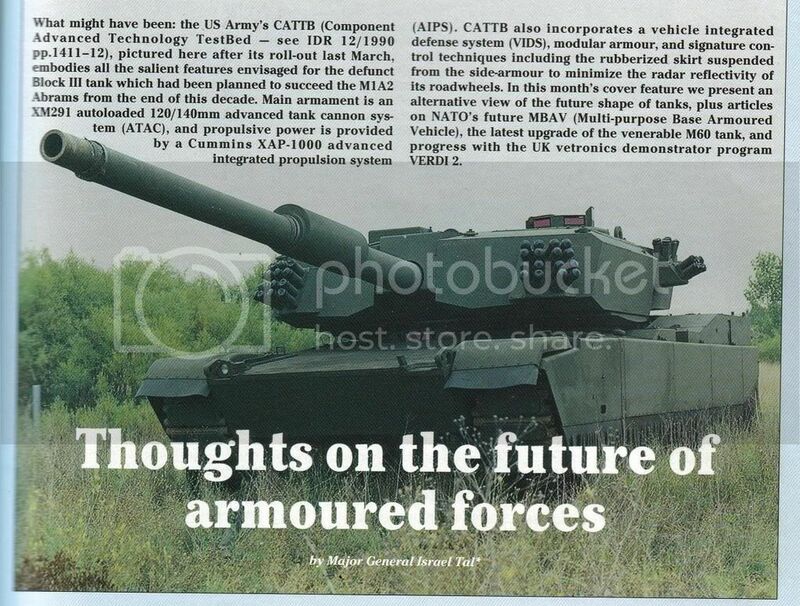 ↑ "ABV Assault Breacher Vehicle engineer armoured vehicle tank". สืบค้นเมื่อ 2010-02-05. ↑ Abramson,Mark, "ABVs ready to break Afghan ground", Stars and Stripes, 1 February 2010. ↑ "Australian National Audit Office report on the DMO project Land 907". Australian National Audit Office. Archived from the original on 17 January 2010. สืบค้นเมื่อ 2009-06-09. ↑ "M1A1 / M1A2 Abrams Main Battle Tank". Army Technology. สืบค้นเมื่อ 2010-06-30. ↑ "Procurement: Iraq Buys What It Knows". Strategypage.com. 18 December 2008. สืบค้นเมื่อ 2009-06-09. ↑ "Iraqi military plans major arms purchase". Your Defence News, 16 December 2008. 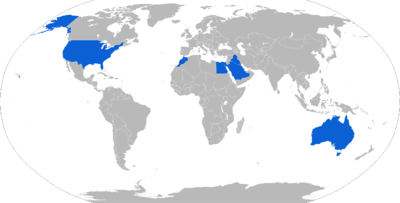 ↑ 58.0 58.1 "The 2006 Saudi Shopping Spree: $2.9B to Upgrade M1 Abrams Tank Fleet". DefenseIndustryDaily.com. 4 January 2011. สืบค้นเมื่อ 28 July 2011. ↑ 60.0 60.1 60.2 60.3 60.4 John Pike (27 April 2005). "M1 Abrams Main Battle Tank". Globalsecurity.org. สืบค้นเมื่อ 2009-06-09. ↑ Agence France-Presse "Greece Considers Free Tank Offer". Defense News, 7 December 2011. Retrieved: 18 April 2012. ↑ "Taiwan mulls buying used US tanks". AFP. 23 July 2012. สืบค้นเมื่อ 23 July 2012. ↑ "Thai mulls buying used US tanks". AFP. 23 July 2012. หน้านี้แก้ไขล่าสุดเมื่อวันที่ 3 กุมภาพันธ์ 2562 เวลา 20:52 น.